Learn how to make the best kue bangkit using tapioca flour and coconut cream. I’m sharing all the tips that will for sure yield that melt-in-the-mouth kue bangkit you are longing for! 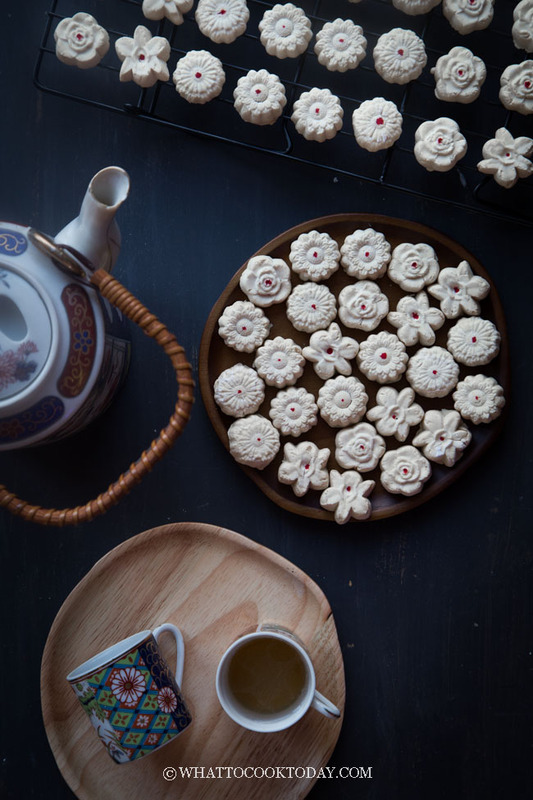 I was invited to a Chinese New Year Cookie Party organized by Vermilion Roots and so I dared myself to make these kue bangkit or in Indonesian Chinese we call it kue bangkek or in Malay kuih bangkit this year. Some Indonesian Chinese population speaks dialects like Hokkian, Teochew, Hakka, and Cantonese. But mainly Hokkian, Teochew, and Hakka. Bang (or phang) in Hokkian dialect means aromatic/flavorful. Kek means cakes though some use it interchangeably to translate cookies/biscuits. 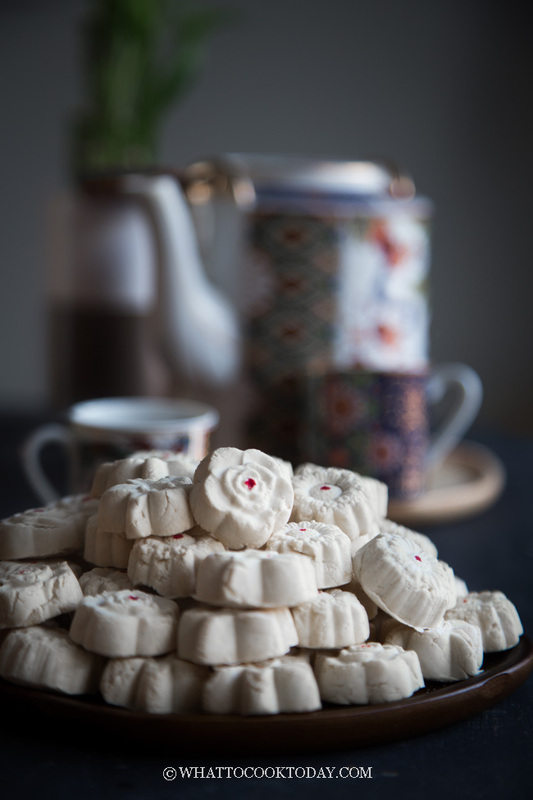 Kue bangkek is named as such because it is a very flavorful cookie. The coconut milk makes the cookies smell super heavenly. I had made probably at least 8 batches of kue bangkit for the past 2 weeks trying to nail that melt-in-the-mouth texture, which is the most important characteristic of these cookies. My mom handed me my aunt’s best kue bangkit recipe and I still failed to make it right. What do I consider as melt-in-the-mouth? When you pop the cookie inside your mouth without biting, you push the cookie with your tongue and it melts when it comes into contact with your saliva. That’s my definition of melt-in-the-mouth for kue bangkit and that’s exactly what you get with this recipe! 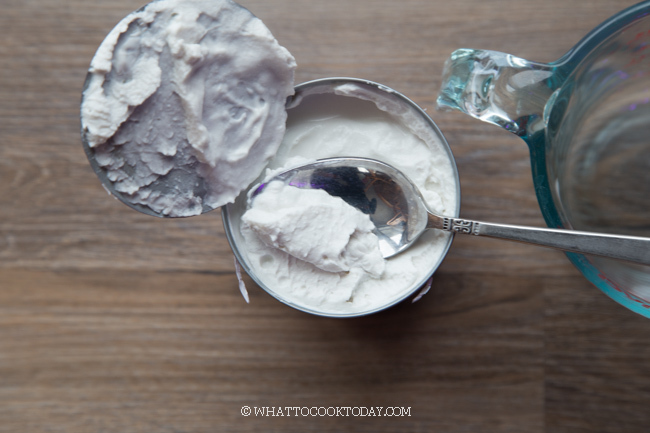 IS TAPIOCA FLOUR AND TAPIOCA STARCH THE SAME? After making batches and batches of failed kue bangkit and finally some really good ones, I can tell you the answer is NO! You don’t need sago flour to make melt-in-the-mouth kue bangkit. I know..I know…the experts out there say so! But I can tell you again, no, you don’t! Trust me on this one 😉 You also don’t need a combination of sago and tapioca, or sago, tapioca, and rice flour, etc. Just tapioca flour/starch. In Medan, we usually make kue bangkit using tapioca starch. There are some people who make kue bangkit with sago flour too, but it’s rare. Sago flour is not common in Medan where I grew up. My aunt who makes one of the best kue bangkit (which recipe I’m sharing with you here) makes it with tapioca starch/flour and it’s AMAZING! I make the recipe more convenient and less “scary” as you think. The one thing that I hate the most when it comes to make kue bangkit is stir-frying the flour for one hour. It’s a mess because the flour gets lighter and fly all over when you stir fry them. So, instead I bake the tapioca flour at 300F (150 C) for 2 hours. I set the timer in the oven and when I came back home, it’s done in the oven. 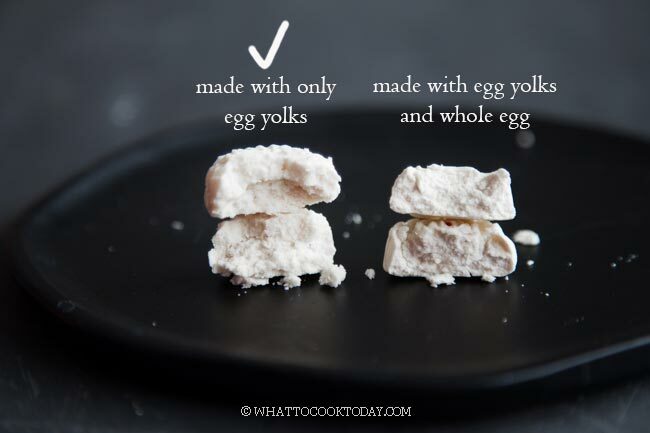 You only need tapioca flour/starch, icing sugar (confectioner’s sugar), eggs, and coconut cream. That’s it! I think I have mentioned that lots of time, but yes, this recipe really gives you that melt-in-the-mouth texture. Just like the way I remember it when I eat them as a kid! 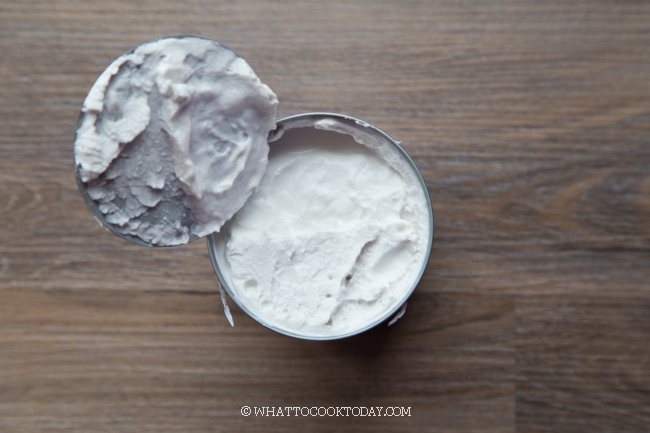 The best creamiest coconut cream will give you that amazing aroma. Hands down! It is important to precook the tapioca starch before it can be used for kue bangkit. The traditional way of doing this is to stir-fry the starch on a dry wok for 1 hour until the starch is light because most moisture has been removed. The precooked starch is cooled down and can only be used the next day. BUT WE ARE GOING TO DO THIS THE EASY YET EFFECTIVE WAY! NO STIR-FRYING AND MESSY HOUSE LOOKING LIKE SNOW STORM HAS JUST PASSED THROUGH! If you want to freshly squeeze your own coconut milk and cream, be my guest. It’s hard to be consistent when it comes to that and I don’t want to mess with that. I prefer to use canned coconut cream. 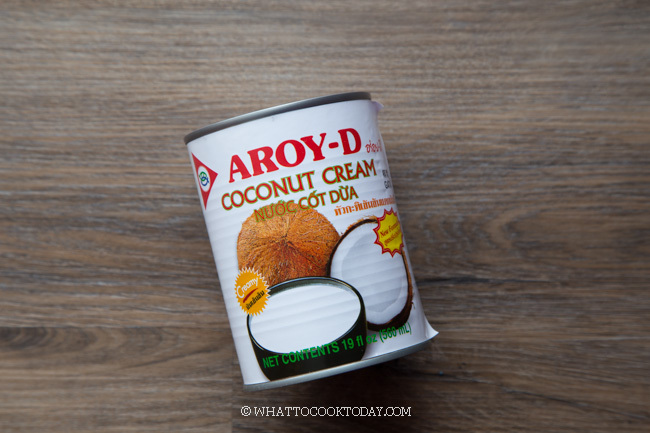 I suggest getting the Asian brands canned coconut cream like Chaokoh or Aroy-D (or other brands you know). And again, you need to get COCONUT CREAM and NOT coconut milk. I can tell you that many of my failed batches of kue bangkit were caused by this point right here! the wrong consistency for the dough. Many recipes out there do not really tell you how the dough suppose to be like. 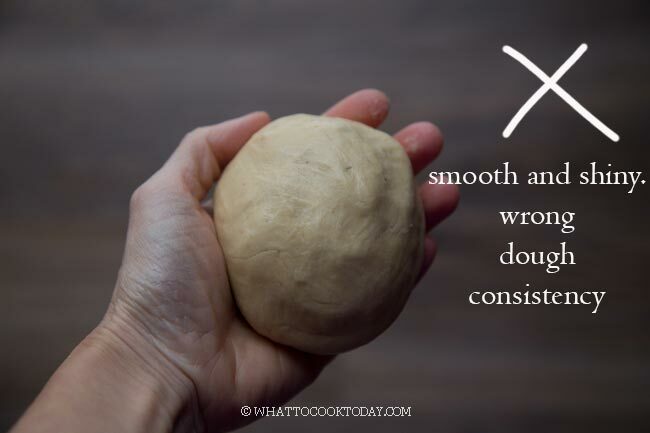 Some even say that the dough needs to be smooth. NO! The dough cannot be smooth and shiny. When you have a smooth shiny dough, you might as well toss that dough in the trash! I’m not kidding! The last two recipes I tried with smooth shiny dough gives me rubbery wet kue bangkit! HORRIBLE! That means you’ve added way too much coconut cream! This is after I mix the flour, eggs, and icing sugar and then add the coconut cream a bit by bit. The amount of the coconut cream in the recipe is just to give you an idea how much you may need. You may not even need all of them or you may need to add more. You should continue to knead the dough while adding coconut cream a bit by a bit until when you press the dough with your palm, it stays, but if you push the dough with your fingers, it crumbles! When you have the urge to add a bit more of coconut cream so that it comes together easier, DON’T! That’s exactly where you should stop. The dough is on the dry side for sure! But can come together when you press it into the mould! Get it? You can pinch the dough to press into the mould, but as you can see, the big dough doesn’t stay in one round piece, there are little crumbles as you pinch the dough. So, the dough consistency is basically exactly like how the melt-in-the-mouth texture is inside your mouth. If you have this, you’ve nailed it! 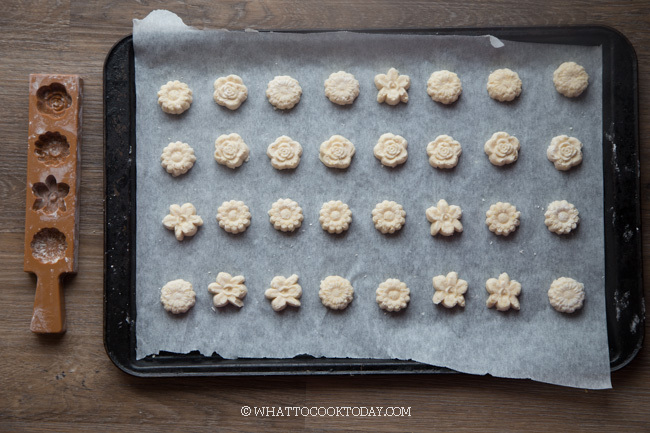 CAN I USE COOKIE CUTTER TO SHAPE KUE BANGKIT? *Recipe was originally published in 2016 and now has been updated with new photos, lots of details and pointers to make sure you can achieve the same result* Please read my post above before attempting to make kue bangkit. It will give you a better understanding how to get that melt-in-the-mouth texture! Learn how to make the best kue bangkit using tapioca starch and coconut cream. I'm sharing all the tips that will for sure yield that melt-in-the-mouth kue bangkit you are longing for! Baking method (highly recommend): place the flour in a large deep pan along with pandan leaves. Bake at 300 F for 2 hours. If your oven has the ability to set cook time, do it! You can be away from the house and when you are back it's done! Once the tapioca flour has cooled down completely, sift the cooked tapioca flour on the scale to give you 500 gr. 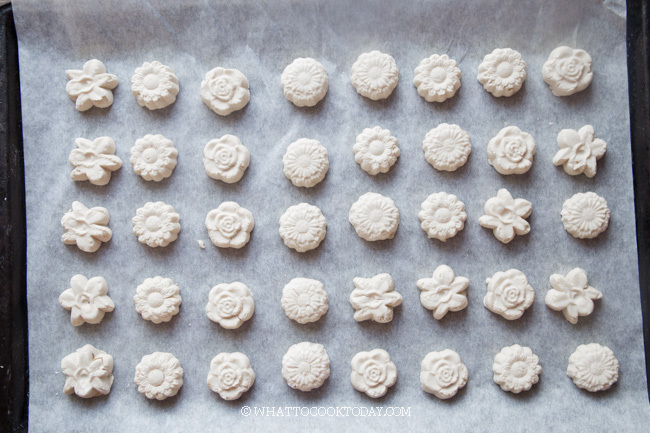 Keep the rest for dusting the cookie mould later. Add in the tapioca flour into the egg yolks mixture. Use a rubber spatula to roughly mix it. It won't come together yet. Add about 100 ml of the coconut cream first and then knead the dough with your clean hand. 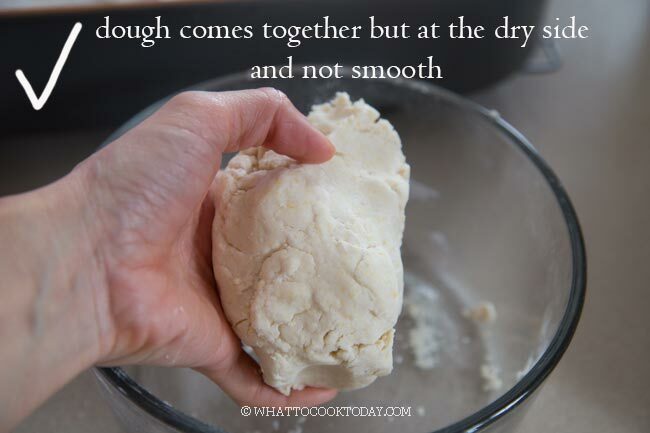 Most likely it will still be too dry to come together, add a bit more, tablespoon by tablespoon and continue to knead. 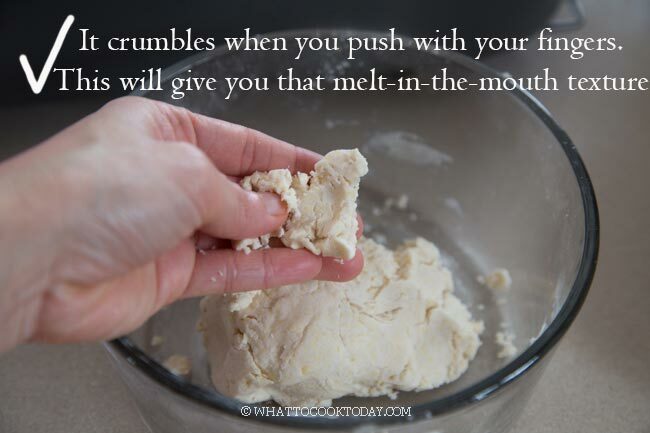 Do this until you come to the point when you can press the dough together into a mass, but it's not smooth and still crumbly when you press the dough with your fingers. Basically it's still a bit at the dry side, but it will hold when you press the dough together. 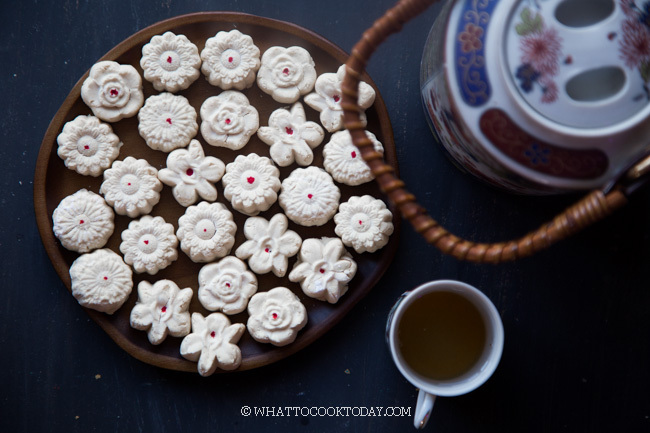 Please check out 15 other talented food bloggers who were also busy baking Chinese new year cookies. You will not be disappointed !!! 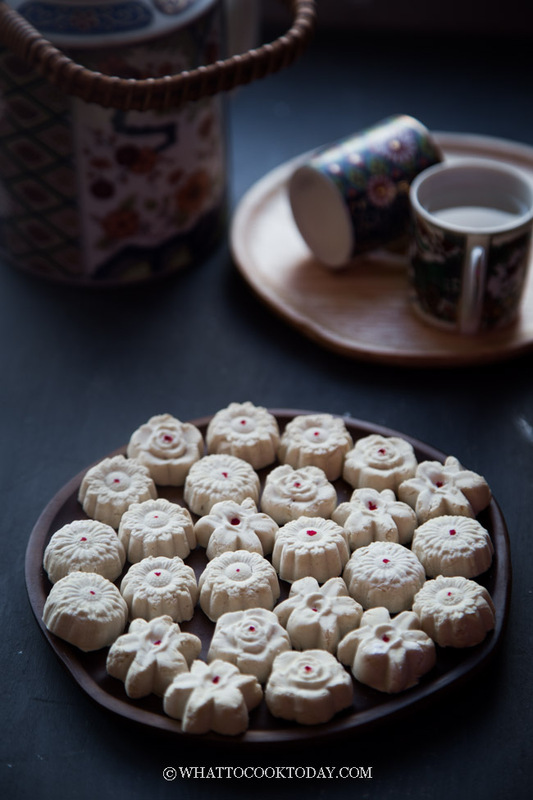 Are you baking any Chinese new year cookies or have you ever baked these kue bangkit santan ? I’d love to hear about it. 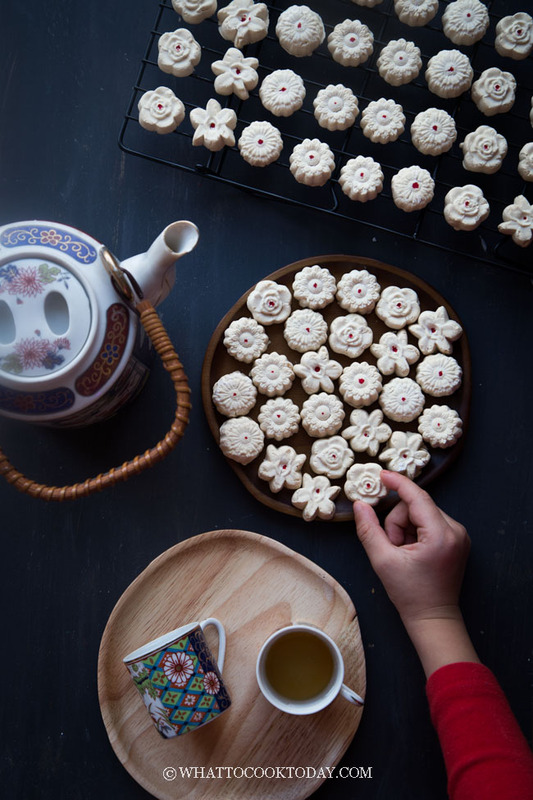 You can always tag your cookies #ChineseNewYearCookieParty if you share it on social medias like facebook, instagram, and twitter. We will go check them out for sure !! wow! these look so good! Almost looks like marshmallows so white and crumbly looking. Wish I could taste it! Yummy! Love love love kuih bangkit. Melt in the mouth literally!!! Santan’s the best ingredient in the whole world. Lol. I agree totally !!! Southeast Asian cooking and dessert depend pretty heavily on Santan !! Thanks Kathleen. That’s the beauty of the wet market we have in Asia. I used to complain a lot when mom asked me to go with her, now I wish I could go there and do my grocery !!! If only I’m allowed to drink coconut milk/cream daily!!!!! 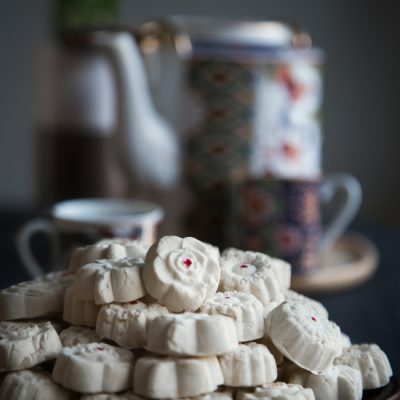 Such a simple cookie recipe! They look scrumptious, too! 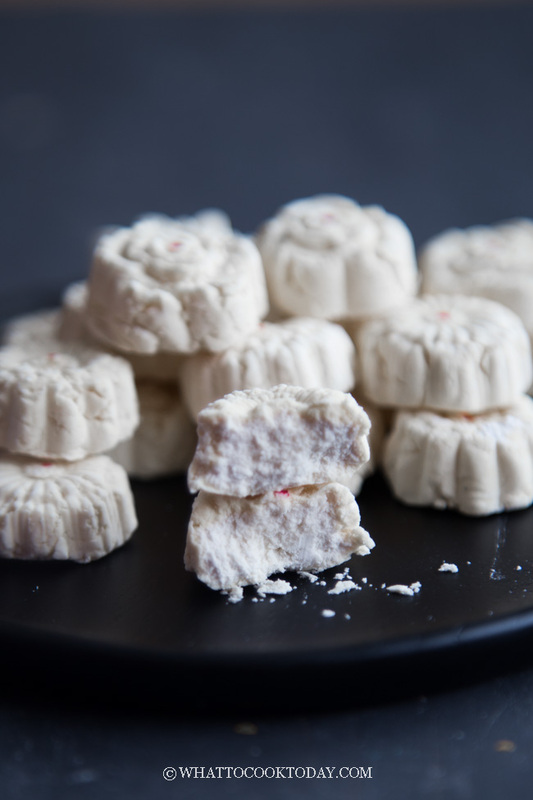 Hi Marvellina, kue bangkit is my childhood favourite cookie (besides peanut ones) and I always finish a tub by myself hehe. 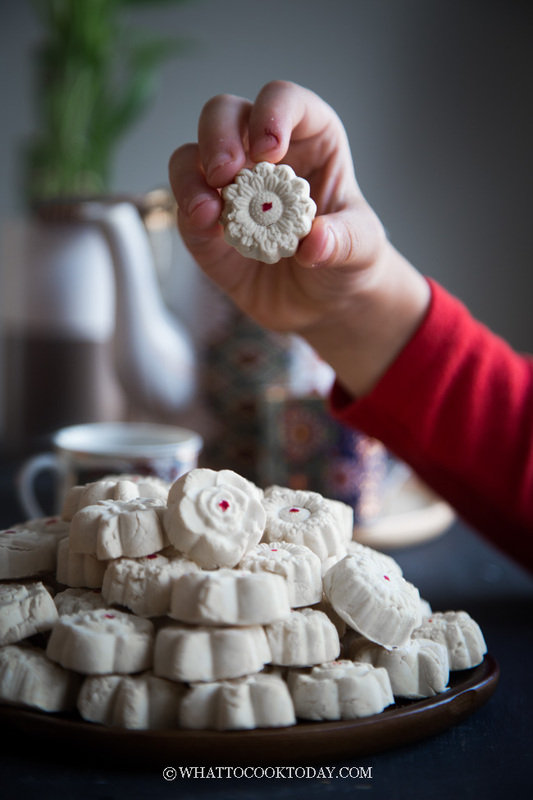 Your cookies look so delicious, wish I have the mould to make them now! Ohhh…this brings back memories! I haven’t tried making this before but will definitely give it a try soon. These look so good! Thanks!! Trust me, I’m trying hard to stay away, but good things my kids love them. So..oh well, they have been eating more than me ha..ha..! oopss! They are tiny little cookies, the photos make them look bigger. 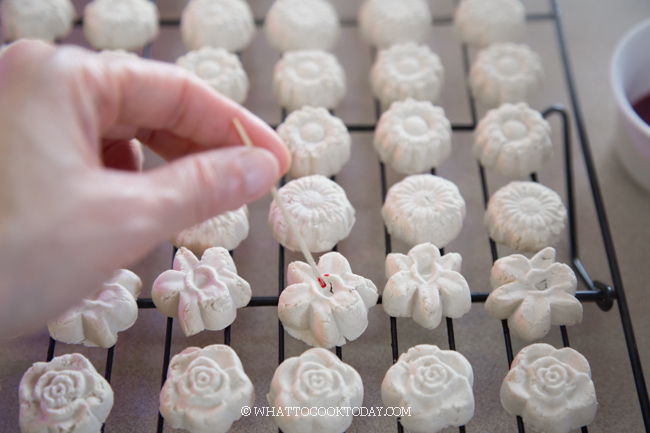 I wish the mould is a bit bigger so I didn’t have to do 120 of them LOL!. Thank you Bonnie. I’m so impressed with your knowledge of Chinese cuisine !!! keep up the good work! Thanks for stopping by Maggie !! Thank you for stopping by Char. Love your creation and blog too !! Ohhh…. 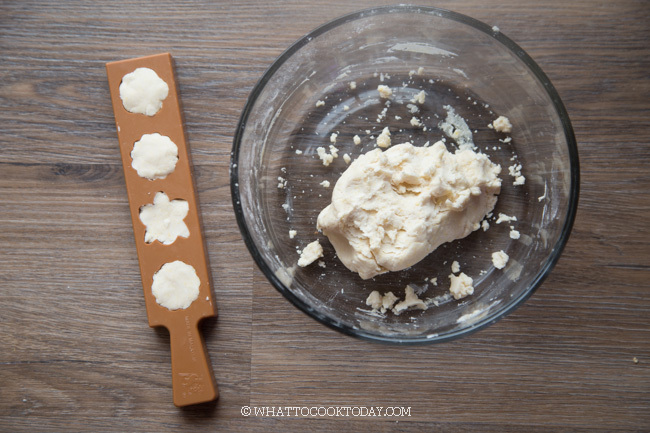 Cookies make with coconut cream? That sounds amazing! These cookies must be really rich in flavors. Love to try some! Thank you Marvellina for sharing the recipe. My family sent me these cookies from Indonesia every year for CNY. I’m going to try to make them myself. 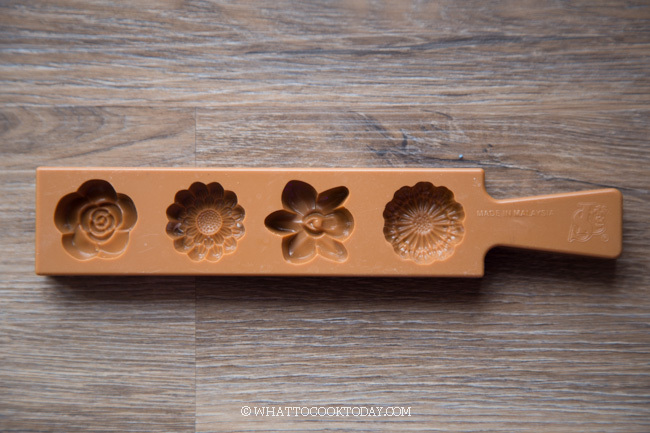 Do you know where I can get the mould in the USA? I got mine from Amazon several years ago. So overpriced and the mould is not so good too. I tried to search kue bangkit mould on Amazon to show you, but no result. I think you are better off having your family sending you the mould from Indo. Much better. The one I got was so overpriced, I won’t recommend getting it from here. Thanks Marv for your response. I was born in Medan but left since I was in middle school. Your recipes brought back fond memories and wish I could go back and visit to Medan. My family now is in Jakarta. I’ll try to get the mould and definitely try your recipe. So many recipes to try especially your biji salak, serabi kuah recipes. I have the images of these dishes but I wasn’t be able describe them to my family because I had them when I was very young and it was probably 50 years ago. Hi Dian, yayy!! happy to hear that it melts in your mouth! The cracking could be the oven temperature a bit high or maybe overbaking a little bit. Maybe can lower the temperature for the last 10 minutes or so.